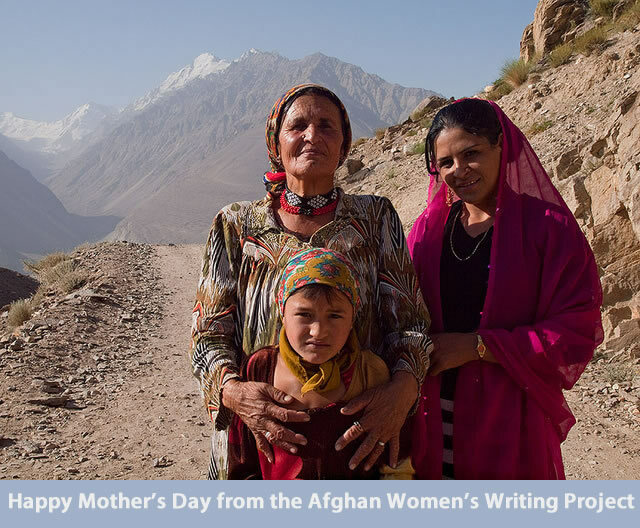 Editor’s note: Our new writers in the southern province of Kandahar got together to send their greetings to AWWP for Mother’s Day. Here are excerpts. Mother is a wonderful gift from Allah to children. Mother is the one who fights for her children and who gives up her own life for theirs. My mom has had a very bad life but she ignored her problems to support us with education and a good reputation in society. My mother had ten daughters. My dad was not happy with all of these daughters. With each new daughter my dad was going to beat my mother, but still she fought for our lives. There is a lot to say, but it can remain in my heart. Mother is the sun that shines in our life. Mother is the light of the home and her children. There is only one person who wakes up in the middle of the night to feed the kids and solve their problems. She is the one who teaches us to walk, to talk, to eat and play, and to respect orders. Without a mother, there is no hope for living in this world. Thank you for reading my essay. Dear Friends, Mother is the teacher and guide in our lives, the one who makes herself available whenever we call her, for any situation. Sometimes I wonder how our moms find the energy to tolerate all our talk and wrong doings. She is a teacher, a nurse, a counselor, and a father for those who have no father. A mother is a bundle of joy and love. We fight with our mothers, shout at them, hurt them, but a mother can never bear to see the eyes of her child moisten. I love my mother and all the mothers of the world who support their children. When I was young, I realized that I had someone in my life to support me for my future. Mother teaches us right and wrong. Mother is the one whose arms are always open for her children. Mother is the one who pushes her children toward what is good and will benefit her children’s lives. Mother is the one who takes care of her children when they are sick. My heart is full of love for my sweet and kind mother. I hope you like what I have written for my mom. What wonderful tributes to mothers everywhere! Thank you for writing about how important strong mothers are and how you value them. Well done all of you! Wonderful. I am a mother and I had tears in my eyes to read your beautiful essay. Keep writing as you write so beautifully and from your sweet heart. I send my salaam and prayers to your wonderful mother. Every mother is great. Every mother is the best teacher. In the process of growing up, she will teach us what to do. When we face any difficulties, she will be the first person come to help you. Whatever you choose, your mother will always be the one who has always supported you. When the child is injured, the mother props up the umbrella for the child. Mother will never give up any one child. Even when she is hungry, she will give the best to her children. They will never complain or ask for any return. They only want children to live better. Mother is the greatest.